We know the feeling. You haven’t changed your tyres in a while, but you’re unsure if you need to change them at all. They get you from A-to-B right? And that’s good enough for most people. However, your car may be in dire need of a new set, especially if you haven’t changed them since you started driving. That’s where we come in. With some simple tips and tricks, we’ll help you decide whether your favourite motor needs a new set of wheels. According to the RAC, your front tyres should last around 20,000 miles, with your rear tyres providing double that. Michelin also advises that tyres should be checked once a year after they have been on your vehicle for 5 years or more. If your tyres have reached these limits, you might want to examine them yourself. The easiest thing to check is the age of your tyres. There’s no need to worry if you can’t remember when you bought them, as there’s a simple way to check on the tyre itself. Each tyre has a coded date that reveals when the tyre was manufactured. It’s usually located on the sidewall of the tyres in an outlined section. It’s a 4 digit code with two indicators. The first two digits represent the week of production. As there are 52 weeks in a year, this number is between 1-52. The second two digits indicate the year, which is the indicator that easily identifies the age. For example, the number 0616 would indicate that the tyre was manufactured in February 2016. Tyres are designed to last at least 10 years when not in use, but they must be stored properly too. We’d advise purchasing new tyres rather than part-worn. You should also choose a well-known brand, such as Dunlop, to ensure that your tyres function as intended. You should remember this question from your driving lessons, as your tyres need to have a tread depth of at least 1.6mm. However, you really should consider changing your tyres before they reach that point. The tread depth impacts your breaking/stopping distance massively, often resulting in shocking differences when viewed in a side-by-side comparison. To check the tyre, you simply need a 20p piece. Just place the coin in the tread grooves of the tyre. If the tread obscures the outer band of the 20p coin, then your tyre is above the legal limit. If it doesn’t, then your tyre is below the limit and you need to replace it. Each illegal tyre on your car is worth 3 penalty points if discovered, and it’s your responsibility to ensure that they’re replaced when necessary. We’d advise checking the tread depth periodically on each tyre, especially if you’ve had them for a number of years. The consequences of a low tread depth can be catastrophic, both financially and physically, so it’s incredibly important to ensure that they’re fully functional. 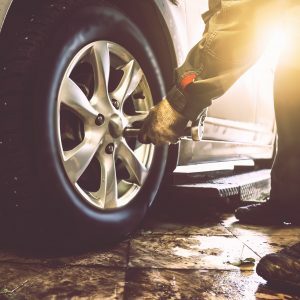 This involves several aspects of your tyres, and you may want to take your car to a local garage and have it examined by a professional. However, if you’re feeling up to it, there are several areas you should check to ensure that your tyres are fully operational. Sidewall Damage – Tears, cuts, bulges and scrapes. You name it, the sidewall has to deal with it. It’s important to check the impact of these marks once you discover them, as they could detrimentally impact your driving experience in the long run. Bead Damage – The bead is the edge of the tyre that sits on the wheel. Damage can occur during fitting or storage, so make sure that you check for a broken or bent bead. Issues may also occur if your tyre is underinflated or overloaded. Separation – Overloading, underinflation and high-speed driving may cause tyre separation in the bead, tread, belt or shoulder. You should be able to see this at a glance, though a mechanic may be able to tell you more. Punctures – In an ideal world, the roads would clean themselves. Alas, this is not the case, so expect to deal with nails, stones and glass on your average commute. It’s important to check both the outer and inner parts of the tyre to ensure that no damage is present. This may seem like an obvious answer, but preference makes a big difference. From the amount you drive to your average speed, it all effects the lifespan of your tyres. For example, you may switch between winter and summer tyres throughout the year, which will decrease the wear and tear on each tyre. Ultimately, you need to do what works around your lifestyle. We’d always advise that you choose tyres from a brand that you recognise, such as Dunlop, and follow the guidance in this article. Find your favourite tyre via Asda Tyres, and don’t hesitate to contact our tyre aficionados if you have any questions. Previous	When Do You Need New Tyres? Next	When Do You Need New Tyres?